"Xi Xia" redirects here. For the Chinese general whose name may be transliterated as Xi Xia, see Xi Qia. The Western Xia (Chinese: 西夏; pinyin: Xī Xià; Wade–Giles: Hsi1 Hsia4), also known as the Xi Xia Empire, the Tangut Empire and to the Tangut people and the Tibetans as Minyak, was an empire which existed from 1038 to 1227 in what are now the northwestern Chinese provinces of Ningxia, Gansu, eastern Qinghai, northern Shaanxi, northeastern Xinjiang, southwest Inner Mongolia, and southernmost Outer Mongolia, measuring about 800,000 square kilometers. The state was devastated by the Mongols who founded the Mongol Empire, and most of its written records and architecture were destroyed. Therefore, its founders and history remained controversial until recent research in the West and in China. The Western Xia occupied the area of important trade route between North China and Central Asia, the Hexi Corridor. They made significant achievements in literature, art, music, and architecture, which was characterized as "shining and sparkling". Their extensive stance among the other empires of the Liao, Song, and Jin was attributable to their effective military organizations that integrated cavalry, chariots, archery, shields, artillery (cannons carried on the back of camels), and amphibious troops for combat on land and water. The full title of the Western Xia as named by their own state is 𗴂𗹭𘜶𗴲𗂧 reconstructed as /*phiow¹-bjij²-lhjij-lhjij²/ which translates as "The Great Xia State of the White and the Lofty" (白高大夏國), or called "mjɨ-njaa" or "khjɨ-dwuu-lhjij" (萬秘國). The region was known to the Tanguts and the Tibetans as Minyak. "Western Xia" is the literal translation of the state's Chinese name. It is derived from its location on the western side of the Yellow River, in contrast to the Liao (916–1125) and Jin (1115–1234) dynasties on its east and the Song in the southeast. The English term "Tangut" comes from the Mongolian name for the country, Tangghut (Taŋɣud), believed to reflect the same word as "Dangxiang" (traditional Chinese: 党項) found in Chinese literature. The Tuoba clan of the Xianbei of Tuyuhun founded the Western Xia. After the Tibetans destroyed the Tuyuhun in 670, its famous prince, Tuoba Chici, who controlled the Dangxiang Qiang submitted to the Tang, which bestowed upon him the imperial surname of Li (李). Towards the end of the Tang, the Tuoba brought troops to suppress the Huang Chao Rebellion (874–884) on behalf of the Tang court and took control of the Xia State, or Xia Zhou, in northern Shaanxi in 881. 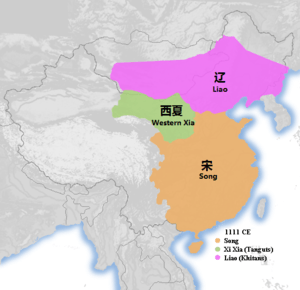 After the Tang fell in 907, the Tuoba descendants formally declared resistance against the expanding Northern Song in 982 and proclaimed independence to establish the Western Xia in 1038. The foundation of Western Xia goes back to the year 982 under Li Jiqian. However, only in 1038 did the Tangut chieftain Li Yuanhao (son of Li Deming, who also ordered the creation of a Tangut script and the translation of Chinese classics into Tangut) named himself emperor of Da Xia and demanded the Song emperor recognise him as an equal. The Song court recognised Li Yuanhao as governor but not as "emperor", a title it regarded as exclusive to the Song emperor. After intense diplomatic contacts, in 1043 the Tangut state accepted the recognition of the Song emperor as emperor in exchange for annual gifts, which implied tacit recognition on the part of the Song of the military power of the Tangut. After Jingzong's death (1048), Yizong became the emperor at the age of two. His mother became the regent and during Yizong's reign, the Liao dynasty launched an invasion of Western Xia, causing Western Xia to submit to the Liao dynasty as a vassal state. After Yizong's death, Huizong was put under house arrest by his mother, and she invaded the Song empire. The invasion was a failure, and Huizong took back power from his mother. After Chongzong became emperor, his grandmother (Huizong's mother) became regent again and launched invasions of the Liao dynasty and the Song dynasty. Again, both campaigns ended in defeat and Chongzong took direct control of Western Xia. He ended wars with both Liao and Song and focused on domestic reform. In 1115, the Jürchen Jin dynasty was established and the Liao emperor fled to Western Xia in 1123. Chongzong submitted to the Jin demand of the Liao emperor and Western Xia became a vassal state of Jin. After the Jin dynasty attacked the Song and took parts of the northern territories from them, initiating the Southern Song period, Western Xia also attacked and took several thousands square miles of land. Immediately following Renzong's coronation, many natural disasters occurred, yet Renzong worked to stabilize the economy. The kingdom developed a Tangut script to write its own Tibeto-Burman language. Tibetans, Uyghurs, Han Chinese, and Tanguts served as officials in Western Xia. 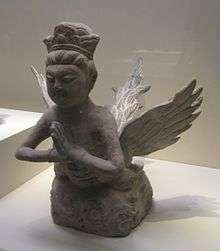 The practice of Tantric Buddhism in Western Xia led to the spread of some sexually related customs. Before they could get married to men of their own ethnicity when they reached 30 years old, Uighur women in Shanxi in the 12th century had children after having relations with multiple Han Chinese men, with her desirability as a wife enhancing if she had been with a large number of men. After Renzong's death, Emperor Huanzong of Western Xia came into power and Western Xia's power began to fail. After Genghis Khan unified the northern grasslands of Mongolia, the Xianbei who resided near Mt. Yin self-proclaimed to be "White Mongols" and joined them. They received the same treatment as the Mongols and partook in their westward conquests in Central Asia and Europe. In the late 1190s and early 1200s (decade), Temujin, soon to be Genghis Khan, began consolidating his power in Mongolia. Between the death of Tooril Khan leader of the Keraites until Temujin's emerging Mongol Empire in 1203, the Keraite leader Nilqa Senggum led a small band of followers into Western Xia. However, after his adherents took to plundering the locals, Nilqa Senggum was expelled from Western Xia territory. Using his rival Nilga Senggum's temporary refuge in Western Xia as a pretext, Temujin launched a raid against the state in 1205 in the Edsin region. The Mongols plundered border settlements and one local Western Xia noble accepted Mongol supremacy. The next year, 1206, Temujin was formally proclaimed Genghis Khan, ruler of all the Mongols, marking the official start of the Mongol Empire. In the same year, Li Anquan killed Huanzong of Western Xia in a coup d'état and installed himself as Emperor Xiangzong of Western Xia. In 1207, Genghis led another raid into Western Xia, invading the Ordo region and sacking Wulahai, the main garrison along the Yellow River, before withdrawing in 1208. In 1209, the Genghis undertook a larger campaign to secure the submission of Western Xia. After defeating a force led by Kao Liang-Hui outside Wulahai, Genghis captured the city and pushed up along the Yellow River, defeated several cities, and besieged the capital, Yinchuan, which held a well-fortified garrison of 150,000. The Mongols, at this point inexperienced at siege warfare, attempted to flood out the city by diverting the Yellow River, but the dike they built to accomplish this broke and flooded the Mongol camp. Nevertheless, Emperor Xiangzong, still threatened by the Mongols and receiving no relief from the Jin dynasty, agreed to submit to Mongol rule, and demonstrated his loyalty by giving a daughter, Chaka, in marriage to Genghis and paying a tribute of camels, falcons, and textiles. After their defeat in 1210, Western Xia attacked the Jin dynasty as punishment for their refusal to aid them against the Mongols. The following year, the Mongols joined Western Xia and began a 23-year-long campaign against Jin. The same year, 1211, Emperor Xiangzong abdicated and died after Emperor Shenzong seized power. In 1219, Genghis Khan launched his invasion of Khwarezmia and Eastern Iran and requested military aid from Western Xia. However, the emperor and his military commander Asha refused to take part in the campaign, stating that if Genghis had too few troops to attack Khwarazm, then he had no claim to supreme power. Infuriated, Genghis swore vengeance and left to invade Khwarazm, while Western Xia attempted alliances with the Jin and Song dynasties against the Mongols. After defeating Khwarazm in 1221, Genghis prepared his armies to punish Western Xia for their betrayal. Meanwhile, Emperor Shenzong stepped down from power in 1223, leaving his son, Xianzong, in his place. In 1225, Genghis attacked with a force of approximately 180,000. After taking Khara-Khoto, the Mongols began a steady advance southward. Asha, commander of the Western Xia troops, could not afford to meet the Mongols as it would involve an exhausting westward march from the capital Yinchuan through 500 kilometers of desert, and so the Mongols steadily advanced from city to city. Enraged by Western Xia's fierce resistance, Genghis engaged the countryside in annihilative warfare and ordered his generals to systematically destroy cities and garrisons as they went. Genghis divided his army and sent general Subutai to take care of the westernmost cities, while the main force under Genghis moved east into the heart of the Western Xia Empire and took Ganzhou, which was spared destruction upon its capture due to it being the hometown of Genghis's commander Chagaan. In August 1226, Mongol troops approached Wuwei, the second-largest city of the Western Xia empire, which surrendered without resistance in order to escape destruction. At this point, Emperor Xianzong died, leaving Mozhu to deal with a collapsing state as the Mongols encroached on the capital. In Autumn 1226, Genghis took Liangzhou, crossed the Helan Shan desert, and in November lay siege to Lingwu, a mere 30 kilometers from Yinchuan. Here, in the Battle of the Yellow River, the Mongols destroyed a force of 300,000 Western Xia that launched a counter-attack against them. Genghis reached Yinchuan in 1227, laid siege to the city, and launched several offensives into Jin to prevent them from sending reinforcements to Western Xia, with one force reaching as a far as Kaifeng, the Jin capital. Yinchuan lay besieged for about six months, after which Genghis opened up peace negotiations while secretly intending to kill the emperor. During the peace negotiations, Genghis continued his military operations around the Liupan mountains near Guyuan, rejected an offer of peace from the Jin, and prepared to invade them near their border with the Song. However, in August 1227, Genghis died of a historically uncertain cause, and, in order not to jeopardize the ongoing campaign, his death was kept a secret. In September 1227, Emperor Mozhu surrendered to the Mongols and was promptly executed. The Mongols then mercilessly pillaged Yinchuan, slaughtered the city's population, plundered the imperial tombs west of the city, and completed the effective annihilation of the Western Xia state. The destruction of Western Xia during the second campaign was near total. According to John Man, Western Xia is little known to anyone other than experts in the field precisely because of Genghis Khan's policy calling for their complete eradication. He states that "There is a case to be made that this was the first ever recorded example of attempted genocide. It was certainly very successful ethnocide." However, some members of the Western Xia royal clan emigrated to western Sichuan, northern Tibet, even possibly Northeast India, in some instances becoming local rulers. A small Western Xia state was established in Tibet along the upper reaches of the Yalong River while other Western Xia populations settled in what are now the modern provinces of Henan and Hebei. In China, remnants of the Western Xia persisted into the middle of the Ming dynasty. 1 2 3 Stein (1972), pp. 70–71. ↑ Yang, Shao-yun (2014). "Fan and Han: The Origins and Uses of a Conceptual Dichotomy in Mid-Imperial China, ca. 500-1200". In Fiaschetti, Francesca; Schneider, Julia. Political Strategies of Identity Building in Non-Han Empires in China. Wiesbaden: Harrassowitz Verlag. p. 24. ↑ Michal Biran (15 September 2005). The Empire of the Qara Khitai in Eurasian History: Between China and the Islamic World. Cambridge University Press. pp. 164–. ISBN 978-0-521-84226-6. 1 2 3 4 May, Timothy (2012). The Mongol Conquests in World History. London: Reaktion Books. p. 1211. ISBN 9781861899712. 1 2 de Hartog, Leo (2004). Genghis Khan: Conqueror of the World. New York City: I.B. Tauris. p. 59. ISBN 1860649726. ↑ Rossabi, William (2009). Genghis Khan and the Mongol empire. Seattle: University of Washington Press. p. 156. ISBN 9622178359. ↑ Man, John (2004). Genghis Khan: Life, Death, and Resurrection. New York City: St. Martin's Press. p. 133. ISBN 9780312366247. ↑ Kessler, Adam T. (2012). Song Blue and White Porcelain on the Silk Road. Leiden: Brill Publishers. p. 91. ISBN 9789004218598. 1 2 Kohn, George C. (2007). Dictionary of Wars (3rd ed.). New York City: Infobase Publishing. p. 205. ISBN 9781438129167. ↑ Man, John (2004). Genghis Khan: Life, Death, and Resurrection. New York City: St. Martin's Press. p. 160. ISBN 9780312366247. 1 2 3 Ebrey, Patricia Buckley (2012). East Asia: A Cultural, Social, and Political History (3rd ed.). Stamford, Connecticut: Cengage Learning. p. 199. ISBN 9781133606475. ↑ Emmons, James B. (2012). Li, Xiaobing, ed. Genghis Khan. China at War: An Encyclopedia. Santa Barbara, California: ABC-CLIO. p. 139. ISBN 9781598844153. ↑ Man, John (2004). Genghis Khan: Life, Death, and Resurrection. New York City: St. Martin's Press. p. 212. ISBN 9780312366247. ↑ Mote, Frederick W. (1999). Imperial China: 900-1800. Cambridge, Massachusetts: Harvard University Press. pp. 255–256. ISBN 0674012127. ↑ Man, John (2004). Genghis Khan: Life, Death, and Resurrection. New York City: St. Martin's Press. pp. 212–213. ISBN 9780312366247. ↑ Man, John (2004). Genghis Khan: Life, Death, and Resurrection. New York City: St. Martin's Press. p. 213. ISBN 9780312366247. 1 2 3 Man, John (2004). Genghis Khan: Life, Death, and Resurrection. New York City: St. Martin's Press. p. 214. ISBN 9780312366247. ↑ Tucker, Spencer C., ed. (2010). A Global Chronology of Conflict: From the Ancient World to the Modern Middle East: From the Ancient World to the Modern Middle East. Santa Barbara, California: ABC-CLIO. p. 276. ISBN 1851096728. ↑ de Hartog, Leo (2004). Genghis Khan: Conqueror of the World. New York City: I.B. Tauris. p. 135. ISBN 1860649726. ↑ Man, John (2004). Genghis Khan: Life, Death, and Resurrection. New York City: St. Martin's Press. p. 219. ISBN 9780312366247. ↑ Man, John (2004). Genghis Khan: Life, Death, and Resurrection. New York City: St. Martin's Press. pp. 219–220. ISBN 9780312366247. 1 2 3 de Hartog, Leo (2004). Genghis Khan: Conqueror of the World. New York City: I.B. Tauris. p. 137. ISBN 1860649726. ↑ Lange, Brenda (2003). Genghis Khan. New York City: Infobase Publishing. p. 71. ISBN 9780791072226. ↑ Man, John (2004). Genghis Khan: Life, Death, and Resurrection. New York City: St. Martin's Press. p. 238. ISBN 9780312366247. ↑ Sinor, D.; Shimin, Geng; Kychanov, Y. I. (1998). Asimov, M. S.; Bosworth, C. E., eds. The Uighurs, the Kyrgyz and the Tangut (Eighth to the Thirteenth Century). Age of Achievement: A.D. 750 to the End of the Fifteenth Century. 4. Paris: UNESCO. p. 214. ISBN 9231034677. ↑ Boland-Crewe, Tara; Lea, David, eds. (2002). The Territories of the People's Republic of China. London: Europa Publications. p. 215. ISBN 9780203403112. ↑ Man, John (2004). Genghis Khan: Life, Death, and Resurrection. New York City: St. Martin's Press. pp. 116–117. ISBN 9780312366247. ↑ Mote, Frederick W. (1999). Imperial China: 900-1800. Cambridge, Massachusetts: Harvard University Press. pp. 256–257. ISBN 0674012127. ↑ Frederick W. Mote (2003). 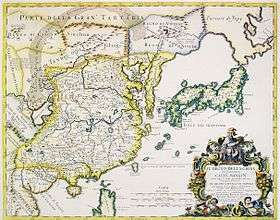 Imperial China 900-1800. Harvard University Press. pp. 256–7. ISBN 978-0-674-01212-7. ↑ Royal Asiatic Society of Great Britain and Ireland (1883). Journal of the Royal Asiatic Society of Great Britain & Ireland. Cambridge University Press for the Royal Asiatic Society. pp. 463–. ↑ Journal of the Royal Asiatic Society of Great Britain and Ireland. 1883. pp. 463–. ↑ Karl-Heinz Golzio (1984). Kings, khans, and other rulers of early Central Asia: chronological tables. In Kommission bei E.J. Brill. p. 68. ↑ Denis C. Twitchett; Herbert Franke; John King Fairbank (1994). The Cambridge History of China: Volume 6, Alien Regimes and Border States, 907-1368. Cambridge University Press. pp. 818–. ISBN 978-0-521-24331-5. ↑ Denis C. Twitchett; Herbert Franke; John King Fairbank (1994). The Cambridge History of China: Volume 6, Alien Regimes and Border States, 907-1368. Cambridge University Press. pp. xxiii–. ISBN 978-0-521-24331-5. ↑ Chris Peers (31 March 2015). Genghis Khan and the Mongol War Machine. Pen and Sword. pp. 149–. ISBN 978-1-4738-5382-9. ↑ Mongolia Society (2002). Occasional papers. Mongolia Society. pp. 25–26. ↑ Luc Kwanten (1 January 1979). Imperial Nomads: A History of Central Asia, 500-1500. University of Pennsylvania Press. p. 123. ISBN 978-0-8122-7750-0. Mote, F. W. (1999). ‘’Imperial China: 900–1800’’. Cambridge, Mass. : Harvard University Press. ISBN 0-674-01212-7. Wikimedia Commons has media related to Western Xia. 宁夏新闻网 (Ningxia News Web): 西夏研究 (Xixia Research). 宁夏新闻网 (Ningxia News Web): 文化频道.